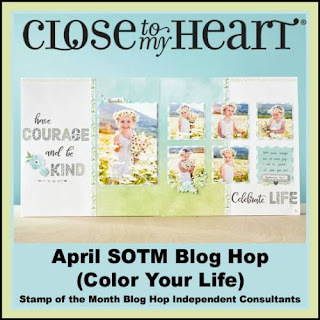 Welcome to the April Stamp of the Month Blog Hop!! 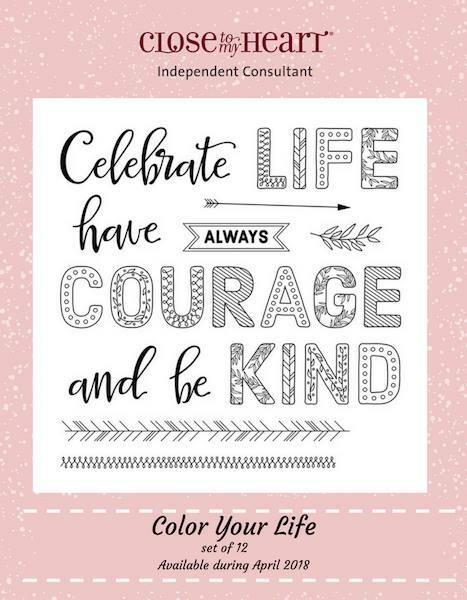 This month's stamp is Color Your Life. It has 12 images!! 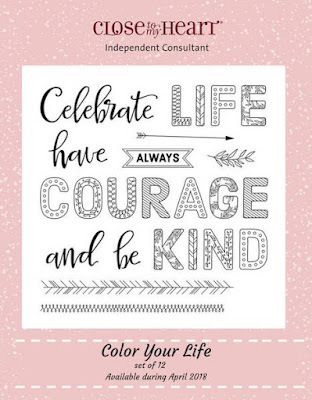 If you came from Michelle Loncar's Blog you are on the right track! The hop is one big circle so when you get back to me you will know you have completed the hop! I created a banner for each of the large words by painting swashes of watercolor paint on watercolor paper. Once it dried, I stamped the words and cut out the banners. I used Gimme Some Sugar paper for this layout so I mixed my watercolors to create tangerine and juniper colors to coordinate. My photo mats are the Blossom washed watercolor papers from the Adventure Fundamental Paper pack. All of the flowers on the layout were actually hand cut from paper. The large cluster on the left page is from one of the PML cut apart cards that is included in the paper pack. Here are a couple of close ups of the layout. I hope you enjoyed this layout and this inspires you to create something! Remember! 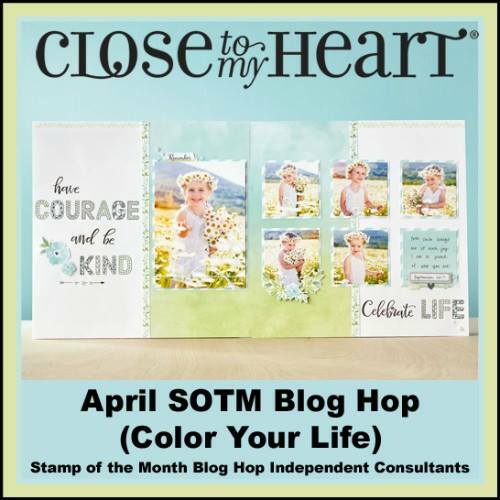 You can only get this stamp during the month of April! 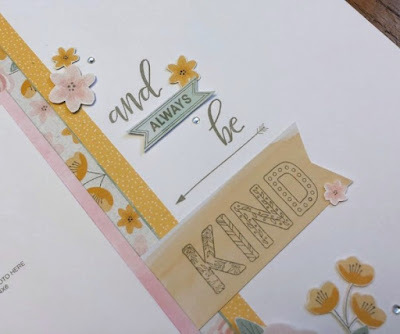 Now it is time to hop over to Colleen Dewis' blog and see what she has created! Love your layout and how you put the papers on the inside. Great use of the stamp set, too. Wonderful layout -- love everything about it! 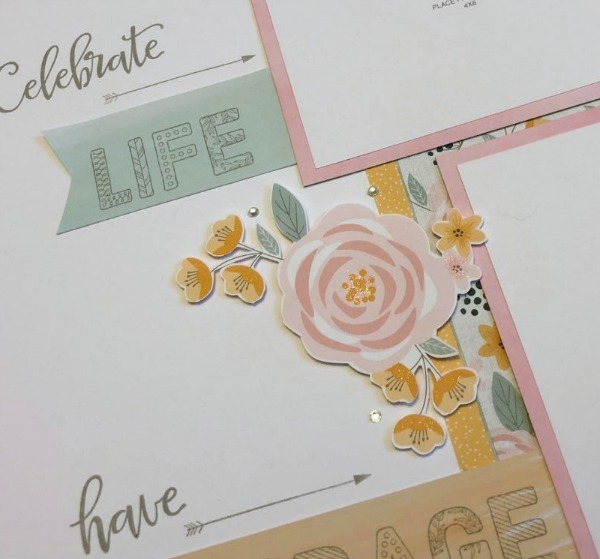 Your layout design and papers are great for this stamp set. Absolutely lovely! Absolutely gorgeous layout and this stamp is a perfect match for this paper! Very pretty layout! Love everything about it - the paper and the way you use used the various sentiments. New ONLINE Summer Card Workshop!